Guandi is known as The Grim Faced God of War and is Circa 16th Century Ming Dynasty, Wanli Period (1573-1620). He is an imposing seated figure about 15cms tall, wearing armour and robes with turquoise, aubergine and mustard details. His head is unglazed in typical period fashion and his expression is absolutely perfect. Tradition states that Guan-di brings luck and prosperity to your household. 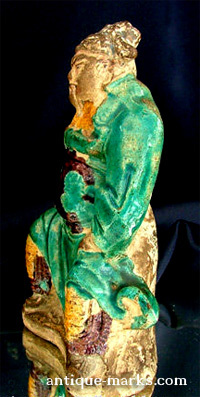 Emperor Guan, the Taoist god of war. He opposes all disturbers of the peace. He is charged with the task of guarding the realm against all external enemies, as well as internal rebels. He was also called upon during spiritualist seances to provide information about people who had died, prophecies concerning the future, and knowledge about divine recompense or retaliation for good and evil deeds. Guan-di was also revered as a god of literature since he supposedly memorized one of the classics of Confucianism, and as patron of bean-curd sellers. His immense popularity rests particularly on his supposed power over demons and evil spirits, and his ability to prevent war. Guan-di is portrayed as a nine-foot tall giant with a two-foot-long beard, a scarlet face, the eyes of a phoenix and eyebrows of silkworms. He is frequently shown standing beside his horse, wearing full armor and carrying a halberd. Alternatively he is portrayed as a military mandarin, sitting unarmed and stroking his beard with one hand and holding the Chun-qiu, the Spring and the Autumn Annals one of the classic Confucian works, in his other hand. In popular belief he is known primarily for casting out demons and people call him Fu-mo da-di, the Great Ruler Who Banishes Demons. His festival is May 13. We found Guan-di at a Yorkshire Auction House and spotted him from across a large room. He was sitting in a display cabinet among loads of plaques and plates and he just dominated the whole area. We’ve had Guandi for a good few years now and he sits in pride of place surrounded by a pair of Jade Dogs of Fu. Has Guan Di brought luck and prosperity to our house … probably. He certainly hasn’t brought anything bad. That’s an awesome looking Chinese figure. He looks as though he really means business and would look superb in my collection of Chinese figures. 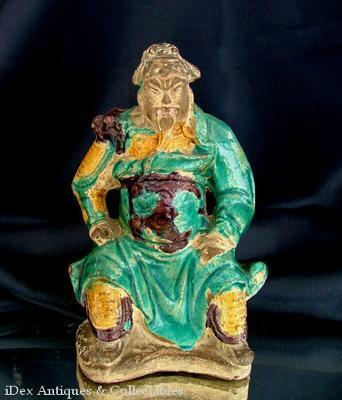 A wonderful Ming dynasty figure, he looks terrific. Love the colors and he appears to be untouched and in very good original condition. I have the perfect spot for him and would also be very interested if you are ever selling him.